As a result of RBI’s initiatives, there has been an increased uptake in banks utilising the IBC with a view to clean up their balance sheets and to realise the best value for their assets. Given the high volume of NPAs in the Indian economy, we expect to see numerous cases go for resolution under the IBC. RBI had traditionally offered banks certain provisioning benefits on restructured assets if certain thresholds were met. Banks and financial institutions often utilised these measures to avoid provisioning for stressed assets and kept these assets marked as standard in their books. RBI has since issued a general circular3 to banks providing that as soon as there is a default on any account, the lenders must initiate steps to cure the default in the form of a resolution plan. For large accounts,4 RBI has specified that the resolution plan must be implemented by the later of six months from the date of default and 30 September 2018, failing which the lenders must refer the borrower for CIRP under the IBC within 15 days from the expiry of the timeline mentioned above. For smaller accounts, RBI proposes to announce the time frame for implementation of resolution plans or a reference under the IBC within the next two years. purely financial entities, such as banks, foreign portfolio investors and alternative investment funds have been allowed certain exemptions from the criteria set out for persons ineligible to be resolution applicants. c the ability of creditors to initiate insolvency proceedings against guarantors. At the time of the last edition of this review, the IBC had been recently notified and companies had just begun to have insolvency proceedings admitted against them. Since then, numerous companies admitted for insolvency have had resolution plans implemented. One key obstacle to the finalisation and implementation of resolution plans has been the objections raised by losing bidders in relation to the eligibility of the winning bidders and the manner in which the bid process was conducted by the resolution professional and the committee of creditors. Set out below are some recent examples of this type of litigation. In Bank of Baroda v. Binani Cement Limited and ors (Binani),6 the corporate debtor, Binani, was admitted for CIRP under the IBC on account of its failure to repay a loan availed from Bank of Baroda. Pursuant to commencement of the CIRP, other cement companies in India submitted resolution plans for Binani. In the bidding war that ensued, the consortium led by a cement player, Dalmia Bharat Limited, emerged successful, and the resolution plan submitted by Dalmia (through its subsidiary Rajputana Properties Private Limited) was selected by the committee of creditors of Binani (Binani CoC). UltraTech Cement Limited, another cement player and an unsuccessful resolution applicant, challenged the selection of Dalmia’s resolution plan by the Binani CoC. One of the key contentions of UltraTech was that the Binani CoC and the insolvency resolution professional (Binani IRP) appointed for the CIRP of Binani did not consider UltraTech’s revised offer (which was higher than Dalmia’s offer) on technical grounds, and that UltraTech’s revised bid offered a much better recovery for Binani’s lenders. The Binani CoC and the Binani IRP had refused to consider the revised offer, as the submission of such revised offer: (1) was not in accordance with the guidelines stipulated by the Binani IRP; and (2) was submitted after the expiry of timelines prescribed by the Binani IRP. The NCLT ruled that the grounds on which the Binani CoC rejected UltraTech’s revised offer were not substantive, and directed Binani CoC to consider UltraTech’s revised offer (and provide an opportunity for Dalmia to match UltraTech’s revised offer) on the basis that a committee of the creditors under the IBC is required to ensure ‘maximisation of value of assets’ of a corporate debtor. Dalmia has appealed to the National Company Law Appellate Tribunal (NCLAT) against the NCLT’s order, which has directed that the process of selecting a final bidder continues, subject to its decision in this matter. Dalmia has also appealed to the Supreme Court against the NCLAT order. The Supreme Court has directed the resolution process to continue but has refrained the Binani CoC from finalising the bidder until it has issued its decision. The decision of the Supreme Court on the eligibility of UltraTech’s bids is keenly awaited as it is likely to be a bellwether on whether the sanctity of the CIRP process under the IBC will be upheld or pragmatism of dispensing with such process may be preferred, in order to obtain optimal outcomes for the stakeholders. In State Bank of India v. Electrosteel Steels Limited,7 Renaissance Steel Private Limited (RSPL) (an unsuccessful resolution applicant) challenged the selection of Vedanta Limited as a successful resolution applicant by the committee of creditors of Electrosteel that was admitted for CIRP under the IBC. The challenge was on the basis that Vedanta was ineligible, under Section 29A(d) of the IBC, to submit a resolution plan. A person is ineligible to submit a resolution plan under Section 29A(d) if such person or a connected party has been convicted of any offence punishable with imprisonment for two years or more.8 In this case, a foreign subsidiary of Vedanta’s parent had been convicted of violation of environmental laws in Zambia, which was punishable with both imprisonment and a fine. Although the relevant subsidiary was only subject to fines, RSPL contended that this should disqualify Vedanta from bidding for Electrosteel. In addition to the above, there are a number of cases where banks have referred large corporate borrowers who have defaulted on loans for resolution under the IBC. For instance, the CIRP was initiated against Essar Steel Limited (one of the largest steel companies in India) in July 2017 and is yet to be completed, primarily because prospective bidders have consistently delayed the process by approaching the NCLT to disqualify other bidders under one or more grounds prescribed under Section 29A. Most of the cases relating to large corporate borrowers are still being resolved and a common feature across all such cases has been the intense litigation at each level initiated either by unsuccessful bidders or by existing owners (in a bid to buy back the corporate debtor). Consequently, managing the CIRP under the IBC will be a key pressure point for banks. Disgruntled bidders, promoters and other affected parties are likely to try to hamper the running of the process by challenging winning bids – especially if the borrower is a large corporate and this is likely to continue as a major source of litigation going forward. In Quinn Logistics India Pvt Ltd v. Mack Soft Tech Pvt Ltd & Ors,13 the NCLAT, while considering a request for excluding a period of 166 days from the count on account of the CIRP being stayed by an interim order passed by the NCLT, has set out a list of illustrative situations in which the time period intervening the insolvency resolution period can be excused from the count. any other circumstance that justifies exclusion of a certain period. Under Section 14 of the IBC, once an insolvency petition is admitted against a corporate debtor, a moratorium comes into effect during which no actions to foreclose, recover or enforce any security interest created by the corporate debtor can be undertaken.14 One of the most vexing issues that has emerged in the past year from the interpretation of the IBC is in relation to the treatment of guarantees and third-party security provided to lenders, when the principal debtor is undergoing CIRP under the IBC. Additionally, doubt was also cast on the status of bank guarantees and the ability to enforce them during the moratorium period. Outside of the IBC, courts have consistently held that bank guarantees are independent obligations undertaken by banks and can be enforced without reference to the underlying obligations, subject to absence of fraud in obtaining the guarantee or where invoking the guarantee leads to irreparable harm. In Nitin Hasmukhlal Parikh v. MGVCL,17 the NCLT held that bank guarantees provided towards a security deposit to be provided by the corporate debtor to MGVCL (a customer of the corporate debtor) cannot be encashed by the customer, while performance bank guarantees provided by banks on behalf of the corporate debtor can be encashed. The rationale adopted by the NCLT is that ‘performance guarantees’ have been specifically carved out of the definition of ‘security interest’ in the IBC, but other bank guarantees have not. Section 14 has now been amended by the IBC 2018 Ordinance expressly clarifying that moratorium imposed under Section 14(1) will not be applicable to a surety in a contract of guarantee to a corporate debtor, which ought to remove the lack of clarity on enforcement of guarantees. The amendment should also cover bank guarantees; however, because of the interpretation of the NCLT that bank guarantees (other than performance guarantees) constitute a security interest, it remains to be seen how cases decided after the IBC 2018 Ordinance coming into force will treat bank guarantee. The IBC 2018 Ordinance does not clarify the applicability of moratorium to enforcement proceedings initiated against third-party security providers. The other difficulty in relation to guarantees has arisen in scenarios where a CIRP has been initiated in respect of the guarantor. The definition of ‘financial debt’ in the IBC clearly includes guarantees of financial debt. No distinction has been made between financial creditors claiming under an ordinary debt and those claiming under a guarantee debt.18 However, in Axis Bank Limited and Ors v. Edu Smart Services Private Limited,19 the NCLT interpreted the definition of the term ‘claim’ under the IBC to exclude any claims under a guarantee by a beneficiary unless the guarantee has been ‘invoked’ and a demand has been made on the guarantor. Consequently, if a CIRP is initiated against the guarantor, then the beneficiary must necessarily invoke the guarantee before the petition is admitted and the moratorium comes into effect. The NCLT has also held that invocation of a guarantee provided by a company is restricted once a CIRP is admitted against that company. These decisions have been appealed to the NCLAT. In 2015, the government passed the Commercial Courts, Commercial Division and Commercial Appellate Division of High Courts Act 2015 (the Commercial Courts Act). The Commercial Courts Act provides for setting up commercial courts at a district level and setting up commercial divisions and commercial appellate divisions in Indian High Courts. These courts will deal with commercial disputes, which will include ‘disputes arising out of ordinary transactions of merchants, bankers, financiers and traders such as those relating to mercantile documents, including enforcement and interpretation of such documents’. The idea behind the Commercial Courts Act is to speed up resolution of commercial disputes in India and, to that effect, the Commercial Courts Act has various provisions (on process and timelines) that, if enforced, would have the effect of streamlining processes and reducing timelines for resolution of disputes. However, given that banks already have recourse to debt recovery tribunals and to NCLTs (under the IBC) to address their disputes, the impact of the Commercial Courts Act on banks may be limited. The Indian government recently introduced the Commercial Courts, Commercial Division and Commercial Appellate Division of High Courts (Amendment) Ordinance 2018 (the Ordinance) to amend the Commercial Courts Act. These amendments have reduced the minimum value of disputes (to determine pecuniary jurisdiction) to 300,000 rupees, thereby bringing more matters into the purview of the commercial courts. The Ordinance also introduced a mandatory pre-institution mediation for suits not requiring urgent interim relief. 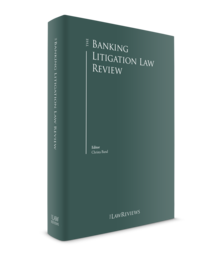 In terms of litigation against banks, common causes have included: (1) failure or delay in repaying deposits; (2) wrongful dishonour of cheques; (3) refusal to grant loans; (4) failure or delay in paying bank guarantees; (5) charging interest at rates higher than those stipulated in the loan agreement; and (6) deficiency in service on various other matters. In addition to the above, for the next couple of years, banking litigation in India is likely to, in large part, revolve around IBC proceedings and matters ancillary thereto (such as resolution of assets, creditor rights inter se, etc.). We have already seen jurisprudence around the IBC evolve substantially since it was enacted and as banks and other creditors continue to make the IBC their first port of call to resolve NPAs and stressed assets, we expect to see the jurisprudence around the IBC evolve even more. The Indian Evidence Act 1872 (the Evidence Act) attaches privilege to communication made during the course of professional employment to legal practitioners, against disclosure of any advice given to the client or against disclosure of communication made during the course of his or her employment. The privilege continues even after the employment has ceased. The protection is given to what might constitute legal advice and not to any other communications from the adviser. In addition, such protection is not granted to the disclosure of any communication made in furtherance of any illegal purpose or the disclosure of any fact observed by the legal practitioners in the course of employment, in case a crime or fraud has been committed since the commencement of his or her employment (as opposed to before the employment commenced). The law further provides that a person cannot be compelled to disclose to a court any confidential communication that has passed between that person and his or her legal professional adviser. However, where such person voluntarily offers himself or herself as a witness, he or she may be compelled to disclose such communications to the court that appear necessary in order to explain any evidence that he or she has given. The privilege under the Evidence Act also extends to the contents or condition of documents with which the legal adviser becomes acquainted in the course and for the purpose of his or her professional employment. Communications containing facts of a matter for the benefit of the legal adviser that are shared for the purpose of seeking legal advice may enjoy privilege. The principle of litigation privilege – that privilege is attached to any document prepared for the purposes of, or in anticipation of, litigation – recognised under English law, is not reflected in the Evidence Act. This common law principle has, however, been recognised by the Bombay High Court.20 In that case, the management of the company had directed for studies to be conducted by its advertising and public relations departments. It was held that the company was entitled to claim legal privilege on the internal communications with the legal and other departments because the documents were brought into existence with the sole purpose of obtaining legal advice. This decision seems to suggest that if any work has been commissioned for the purpose of seeking legal advice, such work product in the form of a document will enjoy privilege. In contracts where one of the parties is foreign, Indian law generally allows the parties to decide the forum21 and the governing law of the contract.22 Parties have the option of submitting to the exclusive jurisdiction or non-exclusive jurisdiction of courts within whose jurisdiction they reside or a neutral forum (i.e., a forum not having a nexus with either of the parties to the contract). The only exception to the rule is if the forum chosen violates domestic law or is against public policy. Other than judgments of superior courts in reciprocating territories,23 foreign judgments cannot be automatically executed in India. To enforce foreign judgments from non-reciprocating territories, the judgment creditor will have to file a fresh suit in a domestic Indian court of competent jurisdiction, on that foreign decree or on the original, underlying cause of action, or both.24 However, foreign judgments are considered conclusive as to the matters adjudicated upon as part of the judgment. Both the execution of judgments from superior courts in reciprocating territories and the conclusiveness of judgments from non-reciprocating territories can be challenged on certain grounds, including: (1) the judgment not being given by a competent court; (2) the judgment not being on the merits of the case; (3) the judgment being founded on an incorrect view of international law or refusal to recognise Indian law, in cases where such laws are applicable; (4) when the proceedings in which the judgment was obtained are opposed to natural justice; (5) the judgment being obtained by fraud; and (6) where the judgment sustains a claim founded on a breach of any law in force in India. The Indian government has recently introduced amendments to the Specific Relief Act 1963, which are yet to come into effect. The key takeaway from the amendment bill is that it makes specific performance of contracts the rule rather than the exception. Under the new amendments, the promisee (the aggrieved party), has a right to have the (breached) contract performed through a third party or by his or her own agency. The promisee can then recover the expenses and other costs incurred for such ‘substituted performance’ from the promisor (the defaulter). Although the amendment specifically clarifies that exercising such substituted performance does not limit other rights of the aggrieved party, such as claiming compensation, it conveys a clear message that specific performance should be adhered to as a rule. Separately, the amendment bill proposes to include a new provision in the Specific Relief Act under which the courts are not permitted to grant injunctions in a dispute involving contracts relating to infrastructure projects (separately defined in the amendment bill) if granting of such injunctions would impede or delay the progress or completion of such projects. Additionally, the amendment bill proposes to designate certain civil courts as special courts to try suits under the Special Relief Act in respect of contracts relating to infrastructure projects. 1 Sonali Mahapatra is a partner, and Raghuveer Parthasarathy is a managing associate, at Talwar Thakore and Associates. 2 www.livemint.com/Industry/WYSqqL6dHMhxFkjuMFUjSL/Banks-set-to-crack-down-on-defaulters-­in-RBIs-second-list.html; most of these companies have now been referred for CIRP under the IBC. 3 RBI Circular No. DBR.No.BP.BC.101/21.04.048/2017-18 dated 12 February 2018 on ‘Resolution of Stressed Assets–Revised Framework’. 4 Defined as accounts where the aggregate exposure of the lenders is 20 billion rupees or more. 5  147 SCL 75 (SC). 6 CA (IB) No. 201/KB/18. 7 CA (IB) No. 227/KB/2018. 8 This sub-section was subsequently amended by the IBC 2018 Ordinance under which a resolution applicant will be ineligible to submit a resolution plan under the IBC, if such applicant or a connected person is convicted for any offence punishable with imprisonment for: (1) two years or more under specific Indian legislation (listed in the IBC); or (2) seven years or more under any law for the time being in force. The amended provision also lists other exceptions and carve-outs. 9 Renaissance Steel India Private Limited v. Electrosteel Steel Limited, Company Appeal (AT) (Insolvency) No. 175 of 2018. 11 AIR 2017 SC 4084. 12 For instance, see Quantum Limited (Corporate Debtor) v. Indus Finance Corporation Limited, Company Appeal (AT) (Insolvency) No. 35 of 2018; Amar Remedies Ltd (Through the Resolution Professional) v. IDBI Bank Ltd & Ors, Company Appeal (AT) (Insolvency) No. 59 of 2018; M/s Shilpi Cable Technologies v. Macquarie Bank Ltd, IA No. 30 of 2018 in Company Appeal (AT) (Insolvency) No. 101 of 2017. 13 Company Appeal (AT) (Insolvency) No. 185 of 2018. 15 For instance, see State Bank of India v. Sanjeev Shriya  144 SCL 545 (All); State Bank of India v. M/s Veesons Energy Systems Private Limited & Ors, Company Appeal (AT) (Insolvency) No. 213 of 2017. Also see IDBI Bank Limited v. BCC Estate Private Limited, where the NCLT held that CIRPs that have commenced against a principal debtor will not restrict insolvency resolution proceedings being initiated against the corporate guarantor for the default of the guarantee debt, given that the guarantor is an independent entity. 16 For instance, see Alpha & Omega Diagnostics (India) Limited v. Asset Reconstruction Company of India Limited, Company Appeal (AT) (Insol) No. 116 of 2017; and Schweitzer Systemtek India Pvt Ltd And Ors, Company Appeal (AT) (Insol) No. 129 of 2017. 18 Where an amount claimed by a creditor is not precise, owing to any contingency or other reason, the regulations governing CIRP issued under the IBC (CIRP Regulations) requires the resolution professional to make the best estimate of the claim. Given the above, as per the CIRP Regulations, all that the beneficiary of a guarantee to register a claim in the insolvency resolution process of a guarantor should have to do is to: (1) provide copies of the guarantee and the facility documents; and (2) financial statements showing that the debt has not been repaid either by the principal debtor or the guarantor. 20 Larsen and Turbo v. Prime Displays Ltd and others, 2002 (5) Bom CR 158. 21 Modi Entertainment Network and Anr v. WSG Cricket Pte Limited, AIR 2003 SC 1177; Piramal Healthcare Limited v. DiaSorin SpA 172 (2010) DLT 131; M/s Gupta Coal India Private Limited v. M/s Swiss Marine Services SA 2014(4)ABR353; Sunrise Industries India Limited v. PT OKI Pulp and Paper Mills and Ors 2017 GLH (2) (226). 22 National Thermal Power Corporation v. Singer Company, AIR 1993 SC 998, the only limitation to this rule is that the intention of the parties must be expressed bona fide and should not be opposed to public policy. 23 Some of the reciprocating territories are: Bangladesh, Hong Kong, Papua New Guinea, Singapore, Trinidad and Tobago and the United Kingdom. 24 Marine Geotechnics LLC v. Coastal Marine Construction & Engineering Ltd 2014 (2) Bom CR 769.